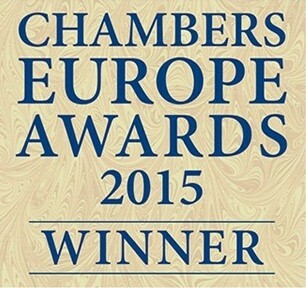 We are very pleased to inform you that on 24 April, at the Chambers Europe Awards 2015 ceremony in Amsterdam, our law firm was named Poland - Law Firm of the Year. This is the fifth time that DZP has won this prestigious Chambers Europe Award for Excellence – we also won it in 2008, 2011, 2012 and 2013. Other law firms in our jurisdiction that were nominated for the award were the international law firms: Clifford Chance, CMS Poland, Dentons Europe Oleszczuk, Linklaters C. Wiśniewski i Wspólnicy and Weil Gotshal & Manges. There were only two Polish law firms: DZP and Wardyński & Partners. This distinction is awarded by Chambers & Partners in recognition not only of achievements in legal advisory but also in the law firm's strategic development, its client services, and the achievements of individual lawyers during the year. Please go to www.chambersandpartners.com for details of the Chambers Europe Awards for Excellence. Chambers & Partners, an international legal publication, has been researching the legal profession in Europe since 1999, identifying leading lawyers and law firms through interviews with thousands of lawyers and their clients. The Europe guide gives an in-depth analysis of the legal markets in 51 jurisdictions.